Everyone was so friendly and helpful! There was a very minor issue with the room, nothing that needed to be fixed immediately, but wanted them to know about it. When we told the guy at the front desk, he was genuinely concerned, took note of it and thanked us for letting him know. Very comfortable and clean. Beautiful view of Lake Superior. Perfect spot if you plan on touring the North Shore, about 1/2 way between Duluth and Grand Portage. And Ely was a beautiful drive. Cascade Vacations was easy to use and the addition of a lock box at the property made the check-in process much easier. 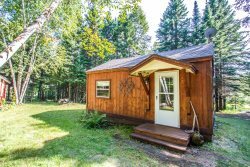 Minn Me is a great little cabin. This was our 2nd stay here. The property is lovely and the house is perfect for a get away. It is very clean and has all you need to cook, extra blankets for cool nights and nice towels and toiletries. Great location for exploring the north shore and being close to Duluth. Walking distance to two harbors restaurants and brewery. There is a distinct smell when we walked into the house. Had to open the windows during the day. Moth balls?? I've been staying here for years, never had a bad experience.